It’s almost 2009 so I thought I’d write a short article on my favourite acoustic guitar singer songwriter albums. The ones that I think are a standout. Yes there are many others but I love these ones. This beautiful album is a mix of blues guitar, slide and Indian music. Yes that’s right Indian from India ( think Sarees, Samosas and Insence type India). Harry Manx is a Canadian guitar player who also plays a Mohan Vina. Think of a guitar that has sort of morphed into a sitar and then you’ll get it. Although at times this album has slight Eastern feel, it is NOT New Age floaty music full of synthisisers and two chords going backwards and forwards. This guy is for real, he has taken the best of East and West and blended it into a very original style that is incredibly beautiful. He plays very nice slide as well. Nick Drake lest the world far too earl. He was a British acoustic guitarist, singer songwriter who played a lot of open-tuned guitar tunes. He had an etherial voice, a bit similar to John Martyn. And John Martyn recognised the influence that Nick Drake had on his music. He dedicated the song Solid Air to Nick Drake. Even today, more than thirty years after his death, his music still sounds fresh and accessible to a younger audience as well as to those of us that listened to him in the seventies. You may notice that the outer cover of the CD is different to the original one, but once you pull the CD out of the sleeve, there is a mini version of the original cover. Ge yourself a copy. Speaking of John Martyn, the Solid Air album set the benchmark in the early seventies, both for John Martyn and other acoustic guitarist songwriters. It included songs like May You Never, Go Down Easy, Over the Hill and other tunes which so many players like myself have added to the their acoustic repertoire. It’s pretty close to the perfect album and has stood the test of time, John Martyn uses a very rhythmic right hand percussive strumming pattern at times, not unlike the Brazilian players. John Martyn is a Scottish singer guitar player. On another album he does a version of the folk song called Spencer the Rover, he manages to tell a story in a very convincing way. John Martyn also wrote the song Head and Heart which was covered by America on the Homecoming album. I’ll cover a few other albums over the next few days. Today I was fortunate to be in a shop buying a present, a Sudoku board game for a family member. I’ve heard that solving puzzles is very good for keeping the brain active, especially when you are getting older. I guess it’s a bit like understanding and working with music theory, specifically improvisation, chord substitution and harmony. 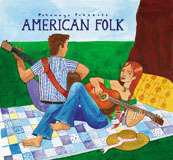 When I was at the counter I saw a CD on sale called American Folk, it’s part of the series from Putumayo, a very cool label that specializes in music of various cultures and specific idioms. Personally, as you may know from visiting this site and my other one the Guitar Player, I’m not locked into one style. So I took a gamble and purchased it quickly as I was in a hurry to get to a Birthday afternoon tea that had lots of yummy stuff and a waiter that must’ve been trained by Mr Bean. This album is one of the best contemporary Folk albums I’ve ever heard, it’s a compilation with a number of players I’ve never heard of, people like Christine Kane, Shannon McNally, Josh Ritter, Jeffrey Foucault, Lucy Kaplansky, Peter Mulvey, Elizabeth Mitchell & DanieL Littleton, and some players that I am familiar with such as Eric Bibb, Natalie Merchant, Patty Griffin and Nanci Griffith. It’s well recorded, good seem simple guitar parts, sensible arrangements, well written tunes and a good balance of tunes that sit nicely together on the one album. Check it out, American Folk, cool as ice-cream. If you want a few tunes to add to your repertoire you’ll find a few on this one. There are some great clean simple guitar parts.